Our guests will find an outdoor pool and hot tub free Wi-Fi a free buffet breakfast cable TV and a pet-friendly policy waiting for them at the non-smoking La Quinta Inn & Suites Vicksburg. The three-story hotel has 77 rooms and suites equipped with refrigerators microwaves and coffee/tea makers. Each room also offers cable TV a clock radio and free Wi-Fi. Get your day off to a bright start with a complimentary Bright Side Breakfast and a free newspaper and save time later to unwind and refresh in the outdoor pool and hot tub. Amenities include a guest laundromat a convenience mart and free parking. Pets are welcome. 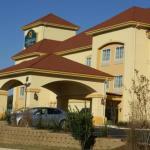 La Quinta Inn & Suites is located on I-20 adjacent to Vicksburg Factory Outlets. Vicksburg National Military Park is a mile away and the hotel is within three miles of downtown Vicksburg the George Washington Ball House Anchuca Historic Mansion and the Old Courthouse Museum. The Southern Cultural Heritage Complex and Biedenharn Coca-Cola Museum are two miles away and Riverfront Park is a five-mile drive. Riverwalk Casino Ameristar Casino and Harrah's are among the casinos located within a 10-minute drive. Jackson-Evers International Airport is 49 miles from the hotel. Dogs of all sizes are allowed for no additional fee; there is a pet policy to sign at check-in. Dogs must be crated or removed for housekeeping, and crated when left alone in the room.